Sun in Scorpio’s fixed, obsessive nature may be too heavy for Moon in Gemini’s light touch. Scorpio will want to go deep, and Gemini will want to skim the surface. This is a very challenging combination that will require both partners’ patience, flexibility and understanding. Sun in Scorpio approaches life from a place of raw honesty. He sees no point in half-hearted attempts. If someone doesn’t grab him, body and soul, he won’t waste his time getting to know them. Thus, his partner can be assured that Sun in Scorpio means business when he commits. But the price of admission to a relationship with Mr. Scorpio includes a willingness to have all hidden thoughts and feelings exposed (Scorpio cannot tolerate secrets, although he will keep a few of his own). He demands profound intimacy and unblinking loyalty; anything less is not considered a “relationship” in his language. His Shadow side will probably surface more than a few times when he broods, fixates or tries to manipulate his partner. Moon in Gemini needs to filter her feelings through her thoughts. This bright, airy Moon loves talking about her needs (and her partner’s needs) as long as things don’t get too dark. Nothing scares Moon in Gemini off more quickly than overwhelming emotional displays. She’d rather analyze what’s happening, then quickly move on to the next topic. This doesn’t mean she can’t feel (or love), it just means that she’s not comfortable beating a topic into the ground. What’s the point, when there’s new and interesting things to consider? 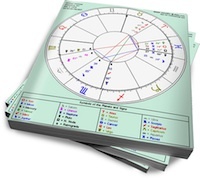 Moon in Gemini will feel swamped by Scorpio’s obsessive focus on her, and Sun in Scorpio will get frustrated as he attempts to pin her down (and figure out what makes her tick). She won’t understand why he fixates, and he won’t understand how she can breeze over relationship issues. If they have other planets in their charts that are more compatible (for example, if she has planets in the emotional Water signs, and he has some Air in his chart) they might be able to make this work. But each will have to make a serious effort to step outside their respective comfort zones, and understand the other’s point of view.